This is the third in a series that depicts ticket stubs from games during Herschel's college days at Georgia. Today's game was the final regular season game for Walker. Of course, no one knew it at the time. 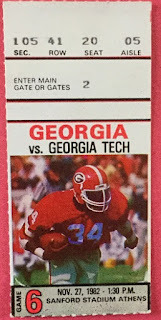 The game took place on November 27th, 1982 against in state rival, Georgia Tech. The meetings between the two teams were so emotional, they were dubbed, "Clean Old Fashioned Hate". Herschel carried 27 times for 162 yards, as the Bulldogs won easily, 38-18. Walker would go on to play Penn State in the 1983 Sugar Bowl, but would lose that contest. Most expected him to return for his senior year and rewrite the record book, but he shocked the sports world by signing with the New Jersey Generals of the U.S.F.L., on February 23rd, 1983. Here is the stub from his last game ever at Sanford Stadium in Georgia.